Khakra is a traditional Gujrati flat bread. It is spicy and can be stored for long period. It is best breakfast for people suffering from diabetes. It is considered to be healthy and nutrious at the same time. Often khakras are carried along for long duration trips, since it remains fresh for 3-4 days. 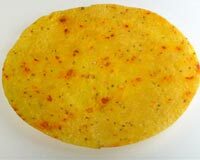 A flat bread that is a traditional food of India. Round, very thin, and soft to crispy in texture, khakhara is a bread that is most often rolled up and used in a manner similar to a utensil to scoop or absorb other foods, such as beans or curried foods. Typically, the khakhara is made with flour, water, and seasonings. The dough is formed into a flat, thin-centered bread that is thicker on the edges. Mix flour, kasoori methi and ajwain. Add salt, ghee and red chilli. Add water to make dough. Keep it for1/2 an hour. Roll out patties or small balls from this dough . Place it in tortilla maker and close its lid. Or roll it into a chapati of 5inch diameter and thin in shape. Heat a Tava , bake the rotis over the tava . Turn or flip sides when one side turns little brownish or is well cooked. When both the sides are cooked and baked properly. Remove from the fire. Similarly prepare other khakras too. Serve with chutney ( preferably green chutney). Shelflife: 3 days at room temperature. Note: Dont use oil. Crispness is what khakra is full off. Oil may loose the crispness of khakras.